This is a serious diagnosis made after careful recording of the anamnesis (patient information) and performing of an endoscopic sinus check-up. Patients often suffer from headaches, nasal secretion, nasal congestion, secretion going down the pharynx, reduced olfactory senses. A specialist otolaryngologist can use the endoscopic exam and see changes in the anatomy, the pathological secretion in the sinuses or a polyp and advise about further treatment. Regardless of whether the treatment will involve surgery or not, the patient can alleviate difficulties if the condition worsens by using the Meralys HA spray for up to 5 days at the most, and then continue administrating the Aqua Maris seawater solution with the nasal irrigation system and Aqua Maris Strong spray, which naturally relieves nasal congestion. It will thus flush the nose, remove dry crusts, make it clear for passage and moisten and regenerate the mucus membrane. 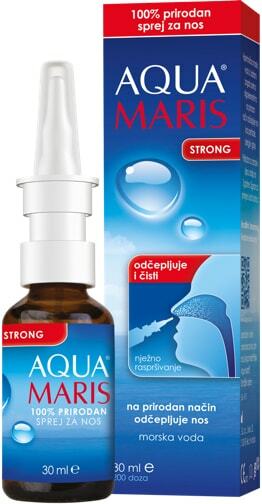 The Aqua Maris nasal irrigation system flushes the nose and sinuses with a seawater solution enriched with myrtle and immortelle essential oils.